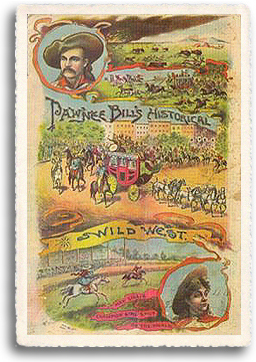 World-renowned Wild West showman Gordon William "Pawnee Bill" Lillie was born the eldest of four children on February 14, 1860 to Newton Lillie, a flour miller, and Susan Conant Lillie of Bloomington, Illinois. Little Gordon was fascinated with the Wild West. When he wasn't working at the mill, he could be found reading dime novels about Buffalo Bill Cody and others. When their mill burned in the 1870s, the Lillie family relocated to Wellington, Kansas, to reestablish their business with the support of local relatives. There the family farmed and would later build another mill. It was in Kansas that Gordon Lillie, now a teenager, would begin his life-long relationship with the Pawnee people, who were wintering near Wellington during their removal to the vicinity of Pawnee, Oklahoma in 1875. Soon, Lillie was spending many hours with the Indians, learning their skills and language. While there, he also made an important long-time friend, Pawnee tribal elder, Blue Hawk. Soon after, Lillie left home and made his way into Indian Territory while working as a trapper with Trapper Tom McClain, waiting tables, and working as a cowboy. He served as a teacher at the Pawnee agency and was also appointed as interpreter and secretary to Major Edward Bowman, U.S. Indian agent. During this time, the Pawnee Indians gave him the nickname "Pawnee Bill." In 1883 he was recruited to form a Pawnee troupe to perform in the first-ever Buffalo Bill Cody's Wild West show. Lillie joined as well, as a performer and interpreter. While traveling with the show in Philadelphia, Lillie met May Manning, a fifteen-year-old Quaker girl who was watching the parade. For the next two years, they maintained a long distance courtship, finally marrying on August 31, 1886. Gordon Lillie made two wedding gifts to his bride; a pony and a Marlin .22 target rifle, and as luck would have it, May proved to be a natural shot. 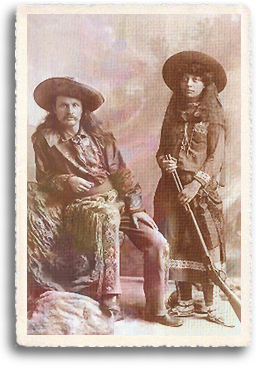 Almost immediately after their marriage, May's family urged Lillie to create his own Wild West show, and in 1888 he recruited backers and organized his "Pawnee Bill Wild West Show." May traveled with the show as the "Champion Girl Horseback Shot of the West." She was one of the first women to perform as an equestrian and shooter in American Wild West Shows. Unfortunately, the Pawnee Bill Wild West Show failed after only one season. In that same year, Pawnee Bill was named leader of the Boomer Movement, a group dedicated to the opening of Oklahoma's unassigned lands to white settlement. He led a group of four thousand into the center of what is now Kingfisher County in the Land Run of April 22, 1889. While on tour in 1907, May gave a speech to women in Chicago, in which she stated: "Let any normally healthy woman who is ordinarily strong screw up her courage and tackle a bucking bronco, and she will find the most fascinating pastime in the field of feminine athletic endeavor. There is nothing to compare, to increase the joy of living, and once accomplished, shell have more real fun than any pink tea or theater party or ballroom ever yielded." 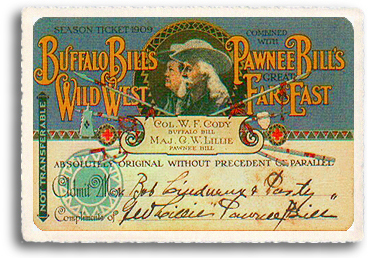 At about the same time Buffalo Bills show was starting to suffer financially, and in 1908, Pawnee Bill purchased a one-third interest in the production. Ultimately, he would purchase the remaining interest in the show, retaining Buffalo Bill as a partner. The production was renamed "Buffalo Bill's Wild West and Pawnee Bill's Great Far East Show." The two traveled together as the "Two Bills Show until 1913, when the venture again went bankrupt. But until it did, it was a Wild West Show that had no equal. The Two Bill's Show became one of the entertainment triumphs of the ages, traveling the world, entertaining audiences and royalty alike with both realistic and fantasy views of the Old West. The show finally closed for good in Denver, Colorado in 1913, after touring for five seasons. Eventually May and Gordon settled in Pawnee, Oklahoma on Blue Hawk Peak, land Lillie had purchased from his friend Blue Hawk in 1902. They lived in a small cabin while building their dream home, a large Arts and Crafts style house. They finished, and moved into their dream home in 1910. After the show closed, Gordon and May settled into their life together on Blue Hawk Peak, where they established a cattle operation and buffalo ranch. After several years of attempting to have a family, they adopted a little boy In 1917, who they named Billy. Tragically, Billy would be killed in a ranch accident when he was just eight years old. While her husband was traveling, May was the hands-on manager of the Lillie Buffalo Ranch. She was also active in the Womens Relief Corp and was a member of the Eastern Star. Lillie's involvement in show business also led to the development of a motion picture company at his ranch, one of its productions being May Lillie, Queen of the Buffalo Ranch. Lillie also expanded into successful endeavors in oil, real estate, and banking. While he dedicated his life to preserving the history of the Wild West, he was also a visionary. He firmly believed in, and lent his support to, the progress that automobiles and modern highways would bring as president of the Highway 64 Association. In his honor, U.S. Highway 64 through Oklahoma was originally called "The Pawnee Bill Route." Pawnee Bill and May became devoted to the preservation of the buffalo, the animal they felt was the most characteristic of Oklahoma and the American West. Once they established the buffalo herd on their ranch near Pawnee, Lillie lobbied Congress to pass legislation to protect the animal. His efforts eventually led to the opening of the Wichita Mountains National Wildlife Refuge. In 1930 Pawnee Bill built and operated "Pawnee Bills Old Town, two miles west of his ranch, a tourist attraction featuring log cabins, tepees, saloons, gunfights, and other attractions from the Old West. Unfortunately Old Town burned to the ground in 1944, along with some of the finest objects of Indian art and artifacts of the Old West. Several of their Wild West Show friends had settled in Taos, New Mexico, and the Lillies made a habit of spending part of every summer in Taos, where they added greatly to their circle of friends. Among that circle were Doc and Helen Martin, who had important roles in the founding of the Northern New Mexico community. Doc and Helen had purchased a number of buildings surrounding a small plaza, and over the years had provided lodging for artists and others who were new to the area, which in the meantime had become a thriving art colony. Just a few weeks later, Gordon and May attended a local celebration in Tulsa, Oklahoma. While driving back to their ranch that night Gordon lost control of their vehicle. May died on September 17, 1936 as a result of injuries sustained in the accident. Pawnee Bill died in his sleep on February 3, 1942. He was 81. Pawnee Bill was truly a promoter of Oklahoma, and it can be argued that no other Oklahoman perpetuated the mythical Wild West as did Gordon William Lillie. Today, visitors can tour Pawnee Bill and May's 14 room, arts and crafts style home, fully furnished with their original belongings. Their dream home, completed in 1910, is filled with Lillie family memorabilia, photographs, original art work, and much more. Still standing is the original log cabin that was home to Gordon and May when they first purchased the ranch, the three story stone barn that he built in 1926 to house his animals, and an observation tower Bill used to look out over his ranch lands. 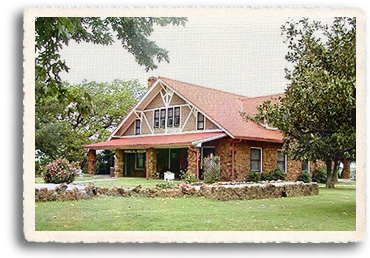 The Ranch property also houses a museum with exhibits related to Pawnee Bill, the Wild West Shows, and the Pawnees. The five-hundred acre grounds also include the original Ranch blacksmith shop and an Indian Flower Shrine - all available for the public to tour. One of the finest herds of bison in the world as longhorn cattle, and several draft horses call the Pawnee Bill Ranch home and can often be found grazing in the drive through exhibit pasture.